In the coming years Skjoldnes will undergo major changes. The current residential area characterised by its beautiful nature will evolve into a more complex neighbourhood. The area will have an increased variety of residential typologies and associated public functions. 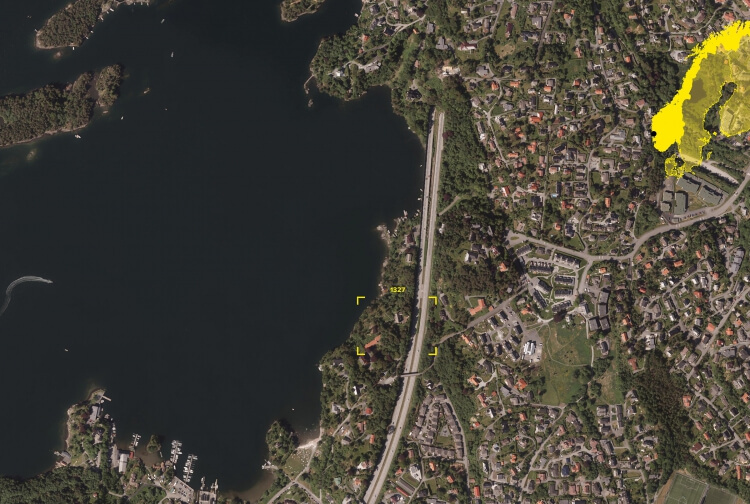 The proposal includes the construction of a longitudinal public park of 230 m on top of the highway that will erase the existing division of the plot and will connect the area with the exceptional landscape of the waterfront again. After the complexion of the first phase the new values that will characterise the future urban area will become apparent. The project has not only the purpose to develop a high quality residential area but to enhance the existing qualities of an exceptional location. The geometry of the buildings that follows the topograpy and the use of natural materials and colors in the facades such as wood, natural stone and metal panels will provide an smooth integration of the projects in the lansdcape. Between Villa Skjoldnes and Konow Lund villa there is a large garden with roots back into the time when the villas were used as residential buildings. The garden includes several large preserved trees and a beautiful pond with picturesque reminiscences. The existing villas are also integrated in the project and they will host different building services for the community. The phase 1 of the project starts in the first quarter of 2017 and is planned to span till the end of 2019. The project is divided in three construction phases that combine 200-225 housing units of different typologies with a total built area of 21 550 m².